The Uniformed Capabilities Support Division (UCSD) serves as the single point of entry in the Secretariat on support and reimbursement issues related to military and police contingents for both Member States and counterparts within the Secretariat, including DPPA and DPO. The functions of this division support aspects of the end-to-end force generation process, allow the Department to better serve the needs of other stakeholders, more effectively analyse different sources of data to identify and address areas of concern, and more efficiently manager verification and reimbursement. It also allows for closer coordination with other units in the Office of Supply Chain Management that provide support to troop-and police-contributing countries, such as the Movement Control Section. 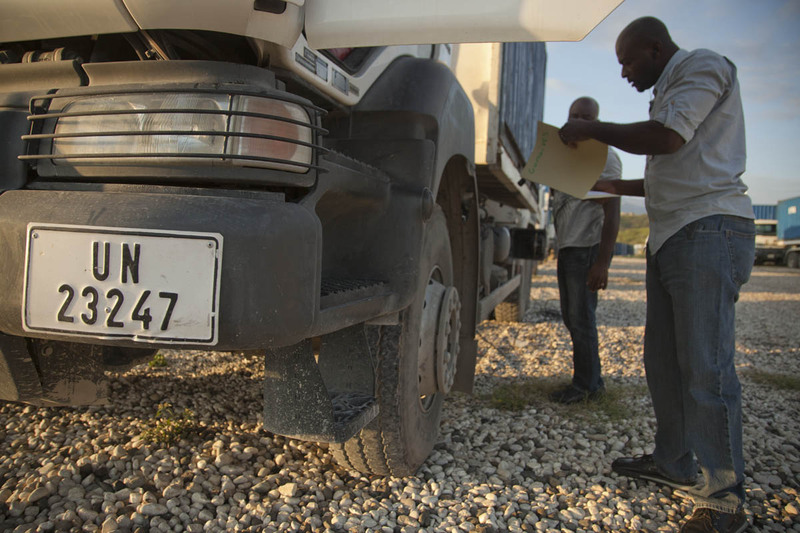 MINUSTAH/Victoria HazouDrivers examine itineraries and travel documents for trucks carrying electoral materials to nine regions throughout Haiti during the 2011 Haitian elections. UCSD supports and governs the reimbursement of personnel and equipment deployed to peace operations. Field missions rely on troops- and police-contributing countries (T/PCCs) to provide critical functions to peacekeeping operations around the globe. The complex nature of modern peacekeeping means that a diverse range of capabilities are required for operations, including police, infantry, transport, logistics, aviation, medical, riverine, communications and engineering units. T/PCCs are critical partners in this endeavour. A core responsibility of the Division of Uniformed Capabilities is to coordinate the policy and application of the Reimbursement Framework covering both personnel and contingent-owned equipment (COE), which set out the rates of reimbursement paid to T/PCCs for deploying personnel, major equipment, and self–sustainment services. The reimbursement system is designed to assist T/PCCs with the costs incurred when deploying on UN peacekeeping operations. The division oversees and supports the process of reviewing, renegotiating and adjusting the rates of reimbursement on a quadrennial basis for personnel, and triennial basis for major equipment and self-sustainment. These rates are examined by the Advisory Committee on Administrative and Budgetary Questions (ACABQ) and the Fifth Committee of the General Assembly, before being approved through UN General Assembly Resolutions. We work closely with T/PCCs to negotiate the formal agreements known as memorandums of understanding (MoU), which set out the administrative, logistics and financial conditions applied to the personnel, major equipment and self-sustainment services deployed on missions. As these agreements provide a legal base for the financial reimbursements, they are established on a unit-by-unit basis. These MoU’s are also used to specify standards in code of conduct expected from UN peacekeepers, including areas such as Sexual Exploitation and Abuse (SEA) and environmental management. This agreement is signed by representatives from both the Uniformed Capabilities Division and the Permanent Mission to the UN of the relevant T/PCC. We also engage regularly with field COE inspection units and T/PCC unit representatives to verify data on the quantity, quality and serviceability of equipment and personnel deployed on operations, and to compare the results with the relevant MoU. Field verification reports (VR’s) are reviewed before being certified and processed for payment. We also conduct regular analysis of T/PCC performance across personnel, major equipment and self-sustainment categories, with the aim of identifying trends, patterns and issues. These analyses are used to generate recommendations for improvements to the system, and to support decision-making at both the strategic and operational level to strengthen the overall partnership with T/PCCs.